Another miniature I used to own back in the day which I’ve recently re-purchased second hand on eBay. 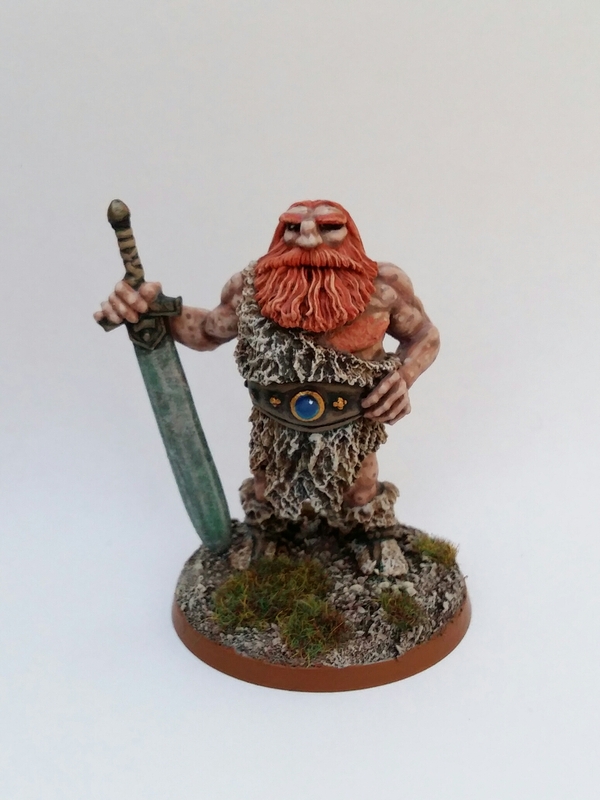 The Fir Bolg are of course a people in Irish/Celtic mythology so I’ve no idea where Ral Partha got the idea that this Giant type miniature resembling a Dwarf Berserker was some sort of Fir Bolg but hey ho – probably some crap 80s AD&D ‘creation’ from the TSR days. The mythical Fir Bolg left Eire and settled in Greece before returning. This particular miniature came to me from a seller in France. As far as fantasy back story I’ve always wanted to use him as a Giant that had been raised and adopted by Dwarfs since birth and so thought of himself as Dwarfish, hence his look. A joke/oxymoron ‘Dwarf Giant’ if you wish. It’s all been a bit quiet here on my blog recently. Purely down to real life not allowing me much time do anything hobby wise other than minimal painting, my weekly gaming session with friends and listening to some gaming podcasts. With this in mind I have a twitter account should anyone be interested – @HobgoblinOrange – the garbled reminiscences of miniatures and RPGs from yesteryear and talk about more modern things. In other words a continuation of this blog. Engage if you can! This entry was posted in Post-1990 and tagged Fir Bolg, Ral Partha on February 14, 2016 by Hobgoblin Orange.